The structure is very similar to the Pathfinder Society Roleplaying Guild. Tonya Woldridge will oversee the program, with John Compton taking on the role of lead developer of both the Pathfinder and Starfinder organized play campaigns. Developer Linda Zayas-Palmer will continue to focus on Pathfinder Society. We've added Thurston Hillman to the team as the dedicated developer for Starfinder Society. Thurston has been a part of Pathfinder Society since Season 1, when he authored Pathfinder Society Scenario #55:The Infernal Vault. Since then, he's both contributed many scenarios (and special events) to the Pathfinder Society as well as writing regularly for various other Pathfinder RPG lines. Thurston brings his depth of experience to the team, along with a bit of zany humor. Is it going to be called "Starfinder Society?" The official name is Starfinder Society Roleplaying Guild, or SFSRPG for short. 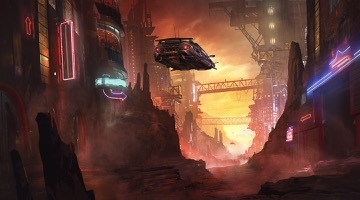 The Starfinder game takes place in the distant future of the Pathfinder world, and while much has changed (or been forgotten), the Starfinder Society traces its mysterious history back to the Pathfinder Society of present day. The campaign's official name reflects this connection. W00T! I for one cannot wait! Ahhh should have suspected we would get news like this :P. Im looking forward to seeing how the faction system works! We have such plans for this program, and there are some really great adventures coming up! Awesome!! Now that the news has hit here, time to tell the rest who don't follow the blogs. Excellent to hear! Don't let the warehouse raptors get you, Thursty! I'm so excited to hear this confirmed. No Grippli will ever be safe again! Seriously, though. This is AWESOME news! The only potential issue I see is that this may split the community even further. The last time I saw this was for Core Campaign which by my observation has fallen flat on it's face. Will there be any preview content for this at PaizoCon? I'm still on the fence about coming this year. Any chance there'll be a PDF subscription to the scenarios ready from launch? ... Is it too late to volunteer to GM at GenCon? To be honest I knew my home groups would not have much interest in playing Starfinder so I didn't think I would ever play it. Sweet! Looking forward to seeing this play out. And yes, starship combat! Hooray! More opportunities to write for Paizo (maybe)! In space, no one can hear the warehouse raptors scream. All the fun! All the pew! All the crazy! No. We are still accepting volunteer applications. The Gen Con leadership team is working on the logistics of adding the Starfinder preference to the volunteer application and integrating it into the data already accumulated. Stay tuned for details. I am a fan of SFS characters numbers starting with 700. This means that I could have character #760-760. I'm staying very, very tuned. Will scenarios that have been GM'd in each Society count towards GM stars? Ad Astra! Glad to see this posted. Will the free RPG day game have a "space" chronicle? Otherwise Yay! Sounds good. Hoping new faction system isn't a rep grind. Definitely looking forward to improved chronicle sheets and hope they get implemented across all products. This looks so cool, murderhobos in space! "Any chance there will be a Boon or some other means of transferring a PFS character to SFS?" If we volunteer for Starfinder, will we get to see a copy of the rules before 8:00 am Thursday at GenCon? Or if the Starfinder hardcover is The Book for GMs at GenCon, will we see the rules before Wednesday afternoon? OK, the logical answer is yes, but how much sooner? A few days, a week, a month? I still remember PFS Season 0 at GenCon with GM's running cold and learning the rules. Woo! Congrats Tonya and Thursty! I'm really looking forward to head out into space and to see how ship combat ends up working in society play. Happy day! I hope to be able to jump in the Starfinder Organized Play on my region. Excited at the prospect of playing some of the first Starfinder games at my first con! This is a general assessment of my feelings. Anyway I am super amped for this. We will never run out of content again! Unlike with the core campaign which split things up to replay games we already played this looks like it will split things up by giving us new and exciting things to play!